Wanting to find a way to further her message of “a future that holds no place for cancer” handbag designer Terry Brindle teamed up with TL Townsend Leather to create a new line of handbags. Using her own battle with cancer, both Ovarian and Breast, and her granddaughter Leah as inspiration, Terry got to work on handbags that would be functional, beautiful and carry a positive message. She designed two handbags with Townsend leathers. A tote with an aniline hand-rubbed black or antiqued chocolate brown, both with pockets featuring the New China embossing. And a Hobo style bag featuring the fun and bright handi-worked foil with the American Gator pattern. Both handbags featuring a cancer awareness ribbon and color coordinating lining. 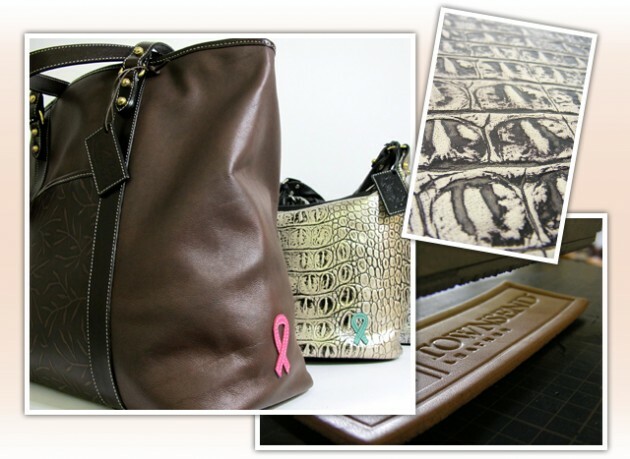 The Terry Tote raises awareness and money for Breast Cancer, while the Leah Hobo raises for Ovarian Cancer. Terry succumbed to ovarian cancer on September 30, 2009. Terry was an incredible woman who designed the Angel collection handbags as a way to make people aware and supportive of cancer research. After defeating breast cancer, Terry battled ovarian cancer for nearly six years. Her life as a cancer survivor and patient was focused on helping those afflicted with cancer and on raising money for research she believed will eventually eliminate this tragic disease.